My brother sounded perturbed, but it was too late. The deed was done. No one lost any toes or took a hatchet to the head. It was just your ordinary, everyday axe throwing at a friendly local pub. Adventure Chick shouldn’t be allowed to handle sharp objects (Exhibit A: Four stitches on Christmas Even from wrestling the lid off a can of condensed milk). But there I was, at Joe K’s Brewhouse on Union Deposit Road, wielding an axe. Why anyone ever thought axe throwing in bars could be a good idea is beyond me, but credit Ron Kamionka with bringing it to Harrisburg. He specializes in bringing the latest entertainment trends to his bars in the Downtown After Dark group. 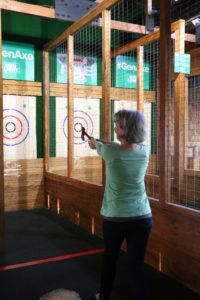 Now, the axe-throwing cage at Joe K’s is a hit and poised to grow, with an outdoor facility coming this summer. Andy Nardone, marketing director for Downtown After Dark, introduced me and Harrisburg magazine Editor Cassie Miller to the sport. 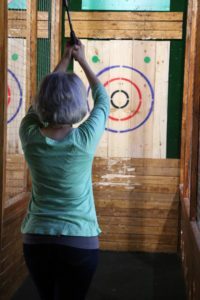 Axe-throwing as bar pastime, he said, originated in Canada. So, some Canadian guy and his friends started throwing axes, and they formed backyard leagues. Bars in New York and Philly and Pittsburgh took it up. Here’s how it works. Sign up in groups of four to 12 people. The group, divided into two teams, plays one lane that’s split into alleys. Four 90-minute sessions are offered most nights. Your host is your “axe-pert,” trained in safety and the finer points of perfecting your throw. Oh, wait. 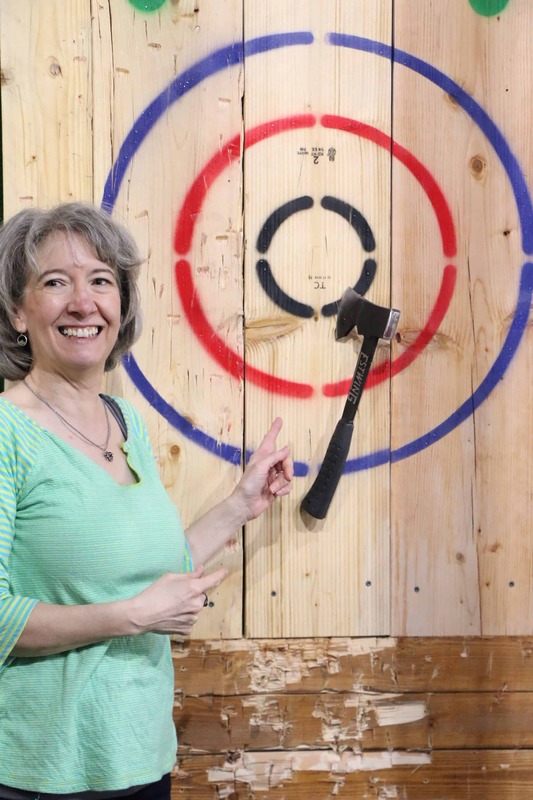 That last one’s not a pun, but it’s an awesome name for axe throwing. Throwers aim at a bullseye target, playing games akin to darts variations. There’s first to 30. There’s 21 – first to reach 21, but if you exceed 21, it’s back to zero. Around the world – throw an axe into each section. Within the target circles, points range from four for a bullseye to one on the outer ring. Green dots over the target, called the kill shot, are worth a whopping five points. Yeah, right. Finesse is my middle name. So now we’ve talked about the basics. “Let’s give it a try,” I said. “Let’s go throw,” said Andy. With my beer in hand – I told Cassie there was no way I was doing this without a beer – I followed Andy into the wire-walled cage in the middle of the dining area. A few other rules, and we were ready to go. Andy planted me halfway between the far and close throwing lines. Dominant foot back. Dominant hand grasps the bottom of the handle. Other hand wraps around it. This is a two-handed experience. Unless you’ve gotten very, very good, you don’t get to throw one-handed. Each competitor gets to pick an ideal spot between front and back throwing lines, because there’s little advantage to being closer or farther in this compact space. On your first throws, the axe-pert watches your form and the rotation of the axe. You want one rotation, which is a function of such factors as your throwing form, your height, and your arm length. Less or more than one rotation, and the axe thuds against the target and falls to the floor. It’s the axe-pert’s job to tune up your form and find the throw that puts blade in board. Soon, I was gripping an axe with both hands. I wasn’t worried about the people to my left and right. But was anyone behind me? What if hoisting the axe over my head sent it spinning Cassie’s way? My grip was probably tighter than it needed to be. Release to where you want it to go, Andy said. I want the bullseye, of course, so here goes. Arms forward. Release the axe. I retrieved the axe from the floor, which just doesn’t offer the same satisfaction of wriggling it out of the board. I stood a little closer for that all-important single rotation. Second throw. A bit better. Sigh. Andy sprayed water on the target. Softens the wood, he said. Well, that explains everything. The wood wasn’t softened. Third try. Two more oomph-y tries. Same results. And then – the briefest of blade sticking to wood, followed immediately by a fall. Wouldn’t count in team play, Andy said. Bummer. Comcast coworkers in the next lane were having a blast. For every bullseye, the axe-pert would ring a bell. I made another throw. Thwack! A hit. Right on the line of the innermost circle. Might even count as a bullseye in league play because most of the blade was inside, Andy said. But I didn’t get a bell, which made me even more determined. Take the stance. Axe over the head. Arms forward. Release. Ding. Andy was ringing the bell, just for me. Success was going to my head. I decided to try for a kill shot. How’d that work out? Maybe I hit somewhere in the vicinity. Beside me, Cassie was taking her own throws. The Comcast guys informed me that they were making toothpicks of the target. I told them I get to show the world how bad I am at this. I did! But as my husband says, even a blind squirrel finds some nuts. 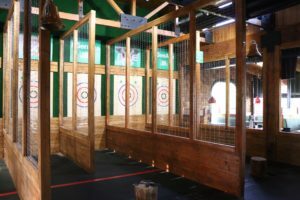 Axe throwing at Joe K’s Brewhouse, 3523 Union Deposit Road, Harrisburg. Learn more and book a throwing time at generationaxehbg.com.